Insta-famous: Junior artist finds success through Instagram - Hwatien Enterprise CO.,LTD. When Alina Bogachuk was six years old, she sketched a portrait of her grandfather. It was a decent piece, well drawn for a six-year-old, and her grandpa hung the portrait on his wall where Bogachuk could see it every time she visited. Almost 15 years later, Bogachuk pulls her iPhone out of her backpack, and checks Instagram to find a slew of notifications. After posting a picture of her latest portrait — oil on canvas — she watches as thousands of followers respond to her work. 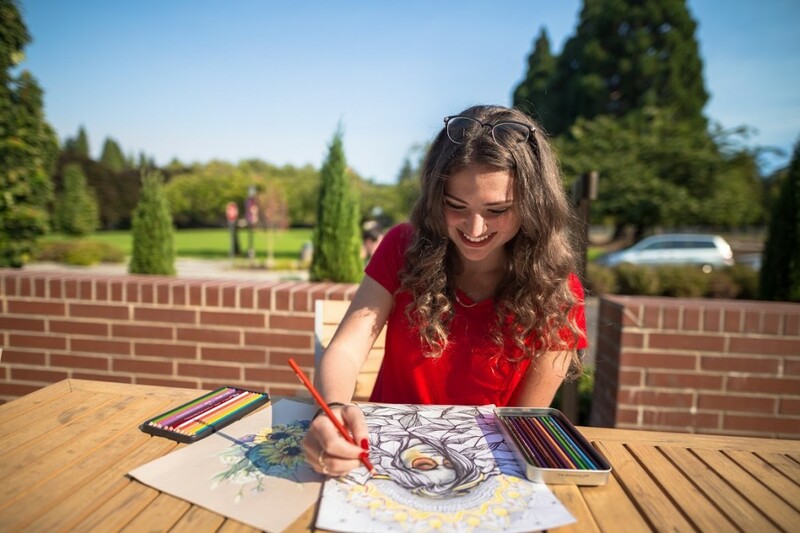 Bogachuk, a junior biology major at the University of Portland, is what some might call “Instagram famous.” Her account @leiartista, where she posts photos of her artwork, has over 188K followers. Bogachuk’s art ranges from tiny acrylic paintings, portraits of friends, doodles in homework notes to full-scale oil paintings. It all started in middle school. At a young age, the Camas, Washington native was always drawing her surroundings and sketching in the margins of her school papers. Her friends lost interest in art as they got older, but Bogachuk never stopped sketching, drawing and painting. When she was in middle school, a new app was just coming onto the scene in 2010: Instagram. Bogachuk made an account to post pictures of her art, track her progress and to share her art with friends. She started out with a small following, but gained momentum with followers as other pages reposted her work and tagged her page. By the end of her freshmen year of high school, she had reached 10,000 followers. Over the years, her Instagram account became a platform for her to share her budding artistic skills. As she gained attention on Instagram, she made more art for her followers and got better as an artist. “I grew with media,” Bogachuk said. Now, Bogachuk posts her art regularly. While she enjoys having a large following, she doesn’t post everything she makes. After Bogachuk’s biology classes are over, she finds time to do something artistic every day, and draws inspiration from the beautiful things around her. A freelance artist, Bogachuk balances school with creating art for personal enjoyment and for sale through her Instagram. People interested in buying her work can contact her via email for rates. She also creates art for her sponsor Prismacolor, an art retailer, and for On The Bluff Studios (OTBS), an on-campus media studio. "Alina and I have worked together for a while now and the most important thing I have observed about her art is that it is her passion,” Sven Shoultz, Bogachuk’s co-worker at OTBS, said. “She doesn't do it because of her Instagram followers or because it is a source of income. Alina draws and paints solely because she loves it, which I find extremely admirable." At OTBS, Bogachuk is currently working on creating the illustrations for an online course on Neuroeducation for UP’s school of education. During the summer, she has more time to focus on larger projects, like full oil paintings. During the school year, she sticks to smaller pieces, like her current favorite works: Small, 6-inch acrylic paintings on pieces of wood. Commissions from her artwork sales are going well. However, Bogachuk's sights are set on becoming a dentist after she graduates. Although the science aspect may seem unrelated to her creative side, her artistic talents and future career will build on each other, she said. Bogachuk plans on continuing to make art as a creative outlet throughout her time in college and during her future career. She would like to do an art show someday of a collective series and she plans on giving more art away to her friends and charities. No matter where the future takes her, art will always be a part of her life.